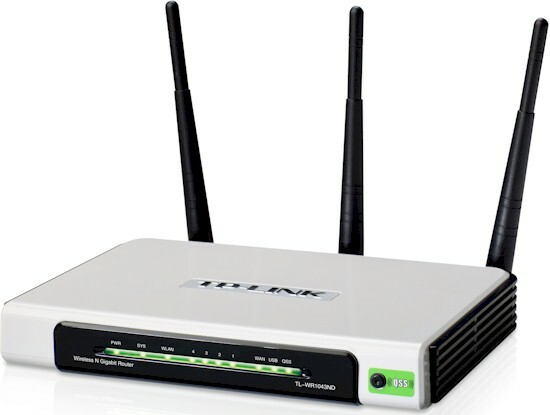 Summary Bargain-priced Gigabit-port 2.4 GHz N router based on Atheros chipset with FTP/UPnP USB drive sharing. If you’re thinking of purchasing a wireless router, the brand names most likely to come to mind would include Cisco/Linksys, D-Link and NETGEAR. But there’s a relative newcomer that is targeting budget-conscious consumers with feature-rich products at budget-friendly prices: TP-Link. For this review, I’ll be looking at TP-LINK’sTL-TL-WR1043ND Ultimate Wireless N Gigabit Router. While the TP-LINK brand may not be a familiar household name, it does have limited distribution in U.S. retail outlets and a much broader online distribution. Click here to see where you can find TP-LINK branded products. Tim covered the design and performance of the TL-TL-WR1043ND in his article. Be sure to read it too for the whole story – it contains a lot of valuable content that I won’t be duplicating. The image above shows the front panel of the TL-WR1043ND. If you like lots of indicator lights, this could be the device for you. There are indicators for: Power; system; Wireless Network; WAN; four LAN indicators and a so-called QSS indicator. TP-LINK has apparently coined their own term, Quick Secure Setup, for what the rest of us know as Wi-Fi Protected Setup (WPS). While I’m a big fan of front-panel status indicators, I was disappointed that the WAN and LAN indicators didn’t indicate the link connect speed. Nor is there any place in the browser-based management interface to indicate link speed on any of the ports. Many competitive routers use multi-color LEDs to indicate either a 10/100 or Gigabit connection. Figure 1 shows the rear panel detail. While I was pleased to see that the ports were color-coded, unfortunately, neither the quick start guide, the easy setup wizard, nor the instruction manual took advantage of mentioning the port colors in the setup instructions. I recently reviewed the NETGEAR WNDR3800, and like the TL-WR1043ND, it also has color-coded ports. But NETGEAR took setup one step further by including a yellow “WAN” cable to correspond to the yellow WAN port, and even labeled both ends of the cable to help the consumer properly connect the device. Though it’s a small detail, in a market that’s increasingly becoming commoditized, attention to detail makes a difference. Before delving into the setup and user interface, here’s a summary of the TL-WR1043ND's features that I compiled from its data sheet and admin interface. Enable/disable bandwidth control with user settable egress/ingress (upload/download) speeds.